As I mentioned in my last post, Rome has to be the most vegan-friendly city I’ve visited so far. Today, I thought I’d share our top tips on how to find vegan eateries in the city and our recommendations on places to eat. Before we headed to Rome, I did some research online. I checked out the reviews on HappyCow.net and TripAdvisor, as well as asking my lovely readers for recommendations on my Facebook page. I also found this really useful website called Vegan Quo Vadis? 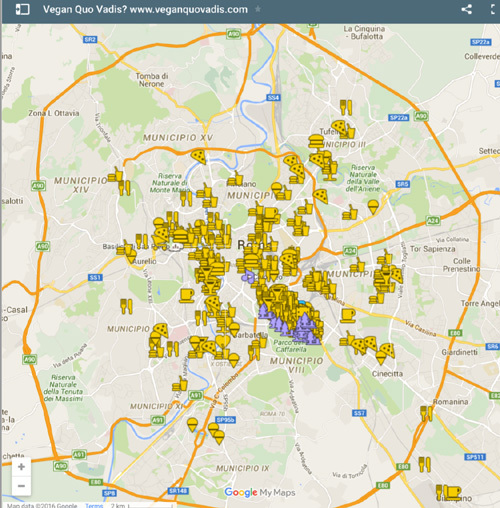 which has a Google map with all the vegan-friendly eateries pinned on it, including cafes, restaurants, delis and gelaterias. I couldn’t believe my eyes when I saw all those pins. There are literally hundreds of them! 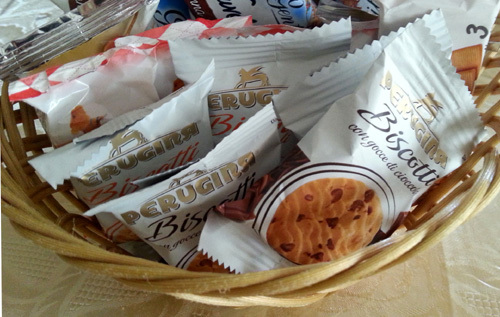 Our stay in Rome got off to a very positive start, thanks to our wonderful host Rosa Maria. Breakfast was included in our apartment rental and in the ‘any special requests’ section of the booking form I’d mentioned the word ‘vegano’. First and foremost, I mentioned this as I didn’t want her going to the trouble of serving us breakfasts that would be unable to eat. I was fully expecting that we would be buying our own breakfast supplies. 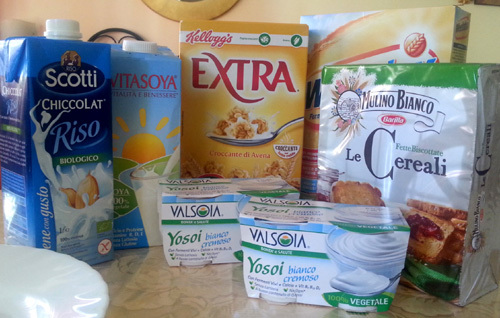 However, Rosa Maria had taken it upon herself to stock the fridge and shelves with a whole array of vegan-friendly foods, including cartons of soya and rice milk, soya yogurts, breakfast cereals, bread, biscuits, jams and a huge fruit bowl. How kind is that? There was also a wide range of teas, a big jar of ground coffee and two coffee machines – an American style filter coffee machine and an Italian espresso maker (that you heat on the hob/stove). I’ve always wanted to know how to use one of these, so I asked Rosa Maria and she kindly showed me. The coffee was absolutely beautiful and saved us a small fortune on buying coffees in the city. Friends had warned me to watch out for service charges when drinking and eating out in Rome. Unfortunately, they’d had some bad experiences of sitting down for a coffee and patisserie, then being billed a small fortune. From what I understand, if you drink coffee standing at the bar, you just pay for the coffee; if you sit down, you pay a service charge. It’s definitely worth checking out. I’d like to say a big “thank you” to whoever produced the Vegan Quo Vadis? map, because it made our trip so easy. 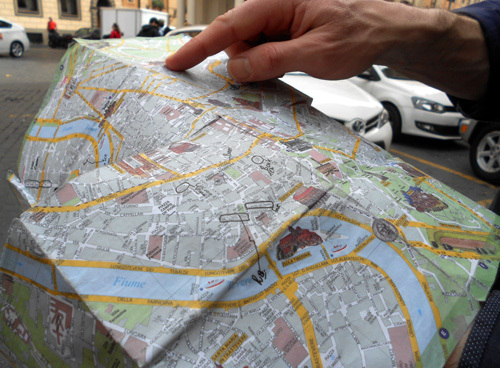 Each morning, we decided which area of Rome were going to visit that day, then we checked out the map (using our apartment’s free WiFi), identified a couple of eateries we liked the sound of, then noted them on our paper map. We then knew exactly where to head for lunch/dinner rather than traipsing around, reading menus and searching for a suitable place to eat. 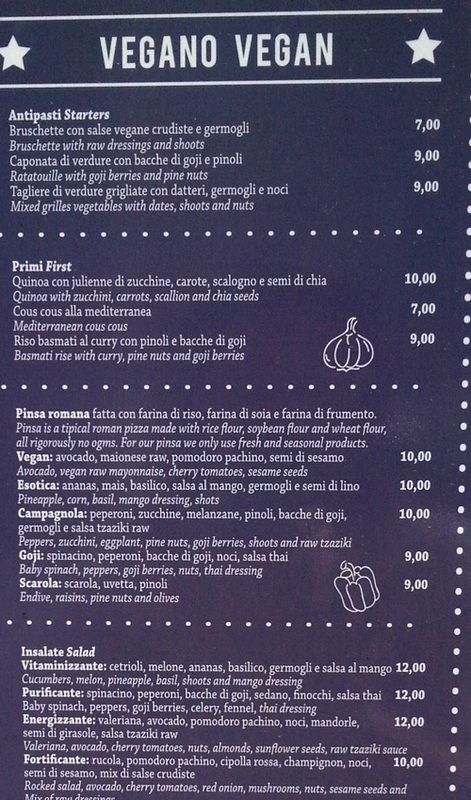 Whatever your eating style, there’s bound to be something to suit you in Rome. There are fast food joints; swank restaurants; healthy/raw restaurants; quirky bistrots; pizzerias; cafes; delis; and ice cream parlours. We only got to try a handful during our stay, but all were really great. Here’s the low down on where we went…. 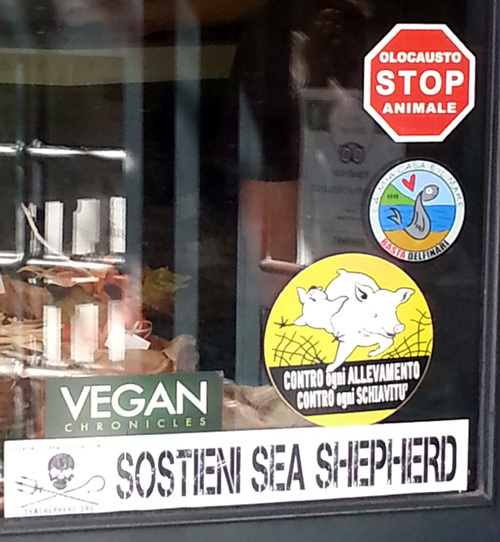 This is a 100% vegan gelateria. It has two branches in Rome. 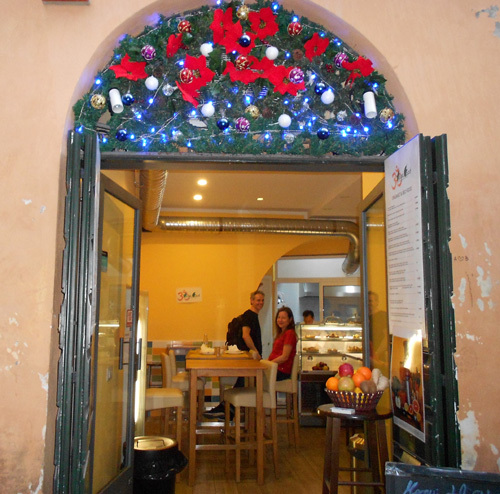 The small takeaway on Via Vittoria Colonna was the closest to where we were staying and we visited it three times during our stay. 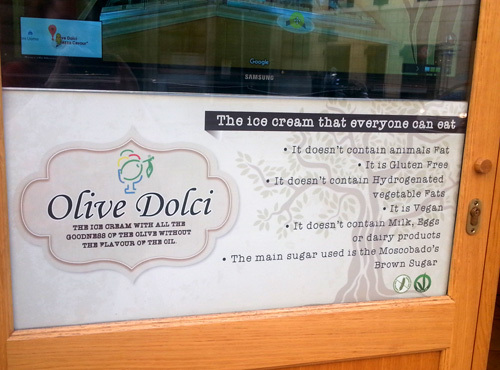 The ice cream is made with olive oil, which may sound strange but it seriously works. 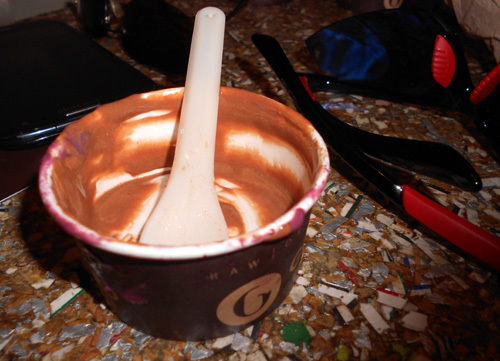 The ice cream is smooth, creamy and totally lush. Between us, we tried the almond, hazelnut, choc chip, chocolate hazelnut and ginger ice creams. 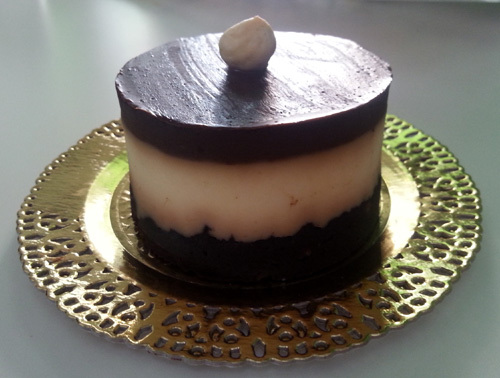 This raw chocolate shop sells the most exquisite hand-made raw chocolates, desserts and ice cream. It’s a small venue, but does have a couple of tables inside where you’re welcome to sit and enjoy your ice cream (at no extra charge). The ice cream is made with almond milk, which they make on site. We tried the blueberry and raw chocolate flavours and both were creamy and delicious. I did ask Lil’ L to take a photo before he tucked in, but it was too late. Big thank you to my reader, Patty, for recommending this place. It was definitely worth a visit! 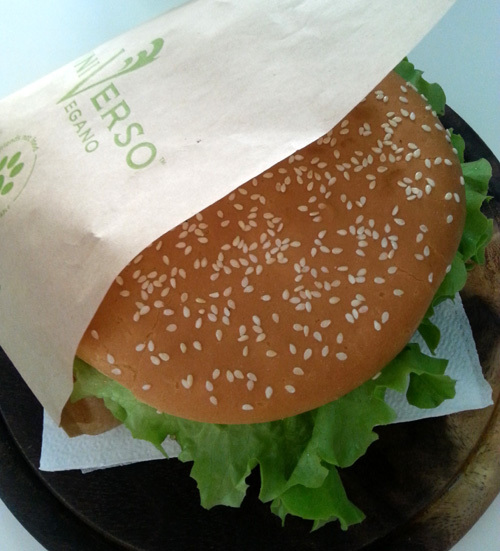 This is a 100% vegan fast food outlet, with an extensive menu to choose from. We loved this place and visited it twice for lunch. It’s a small venue, but hugely popular. We even saw members of the Carabinieri (Italian police force) come in to order their lunch! There are four tables inside and, if you want to sit down, I’d recommend getting there for opening time (12.30pm). The burgers are huuuuge! Definitely the largest bap I’ve ever eaten! Between us, we tried the burgers, omelette focaccia and seeded sandwiches. All the food was lovely, but I personally preferred the sandwiches as I loved the super seedy, wholegrain bread. The desserts are lush too. 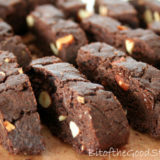 They’re pretty filling, so one dessert can easily be shared between two or three people. We especially loved this blueberry cheesecake. Organic Indian street food is on the menu at this establishment. It’s a tiny venue (set up principally for take outs) but there are a couple of tables inside. We visited soon after it opened so we were able to bag a table. I checked with the chef and with just one exception – the lassi drink – the entire menu was vegan. We chose some pakora as a starter and dosa pancakes with curry filling for our main course. The curry is freshly made to order, and the chef checked how spicy we’d like it. I requested super mild as I’m a heat wimp. The kitchen is pretty open, so I was able to watch him cook the food as I sipped on my Ayurvedic tea. I don’t think I’ve ever since such a clean kitchen. It was literally sparkling! Located on one of the main streets, this place is pretty unassuming from the outside but has a beautiful, spacious interior. 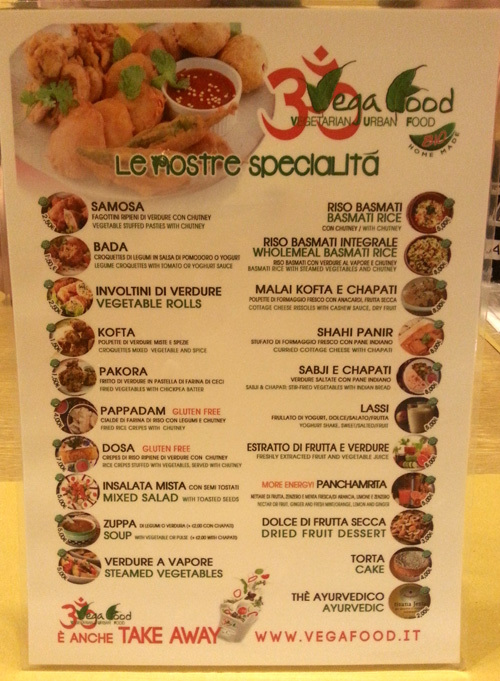 We hadn’t planned to visit this place, but the ‘vegano’ menu on the board outside happened to catch my eye as we walked past. It was closed at the time (mid-afternoon) but we returned in the evening; and I’m so glad we did. We chose the pinsas (a Rome-style pizza) and a portion of fries to share between us. 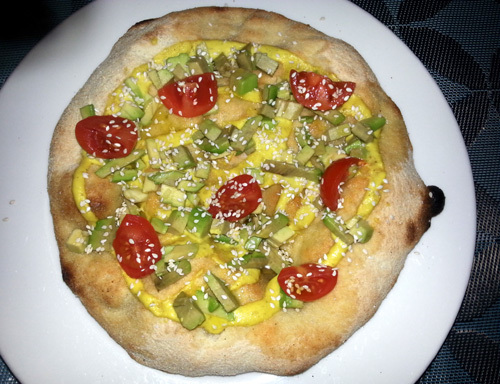 The first night we had the “pinsa vegan” topped with vegan mayonnaise, avocado, cherry tomatoes (Lil’ L switched for aubergine) and sesame seeds. Like every place we ate in Rome, the staff at Buddy were really helpful. When Lil’ L asked to switch the toppings on his pinsa, they were more than happy to oblige. We enjoyed this place so much that we decided to return for our last lunch before heading back to the UK. This time we had pinsas topped with vegan mayonnaise, grilled courgette, bell pepper and aubergine, sprouts and pine nuts. They were so delicious! 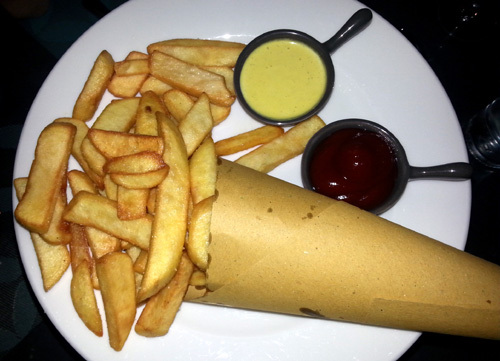 And of course, we couldn’t resist another portion of those amazing fries. 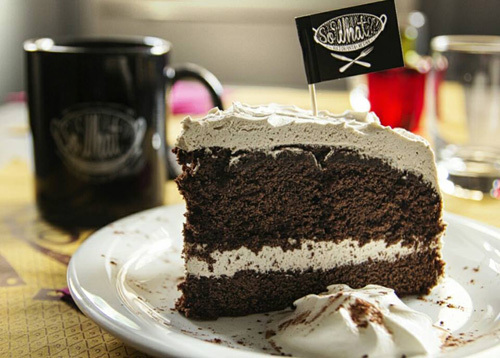 Buddy does sell home-made desserts and cakes too, including at least one vegan option. We didn’t get to try them this visit though as we were so full up! In my experience, all “proper” Italian restaurants (i.e. ones where the pizzas are freshly made to order) are happy to serve their giardinera pizzas without cheese. 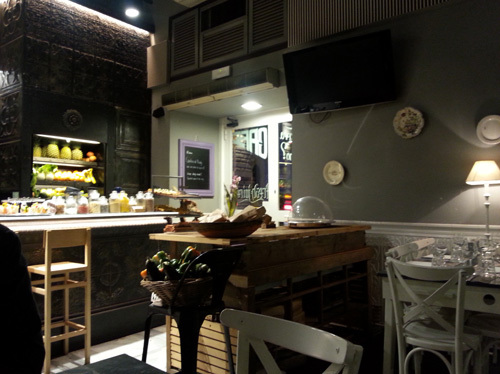 One night we opted to go to Saltimbocca in the heart of the historic quarter. What first attracted me to this restaurant was the message written on their menu board, emphasising that there were no service charges. This reassured me that we weren’t going to be stung with a bigger bill than expected. Saltimbocca is a lovely, spacious restaurant with plenty of seating. We asked the waitress if we could order giardinera pizzas without mozzarella cheese in order to make them vegan. She told us it was no problem at all. 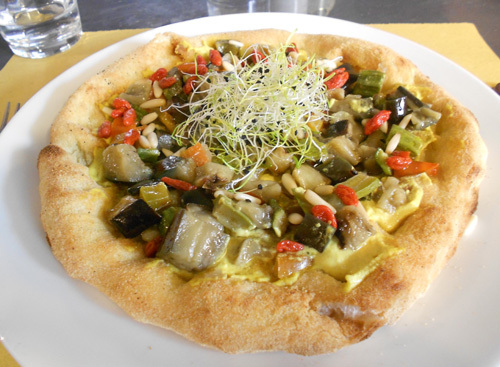 The pizzas were topped with grilled vegetables – slices of melt in your mouth aubergine, courgette and pepper. They were absolutely delicious. 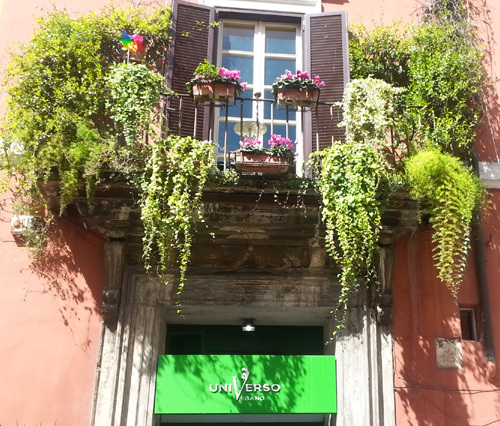 While in Rome, I would also recommend checking out the GoGreen store. This place is filled to the brim with eco-friendly products, including clothing, footwear, toiletries, cosmetics, foods and toys. 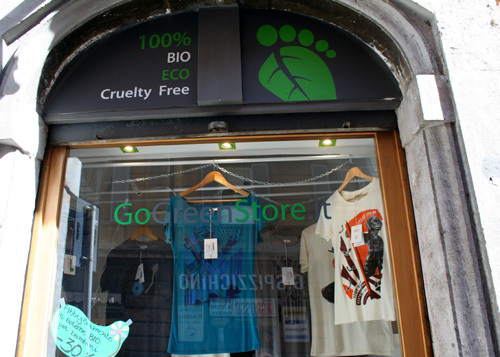 They had some gorgeous t shirts made with organic natural fibres. I had my eye on one, but when I returned to the shop on our last day, I arrived too late and it was already closed for the afternoon. My mistake. 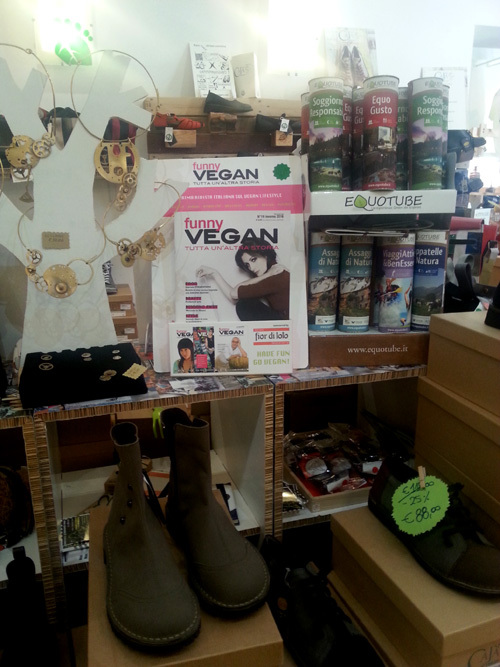 Yes, you did read that right… the Italians have a vegan magazine called Funny Vegan. That did make me chuckle a.lot. The one I missed… So What? After reading their rave reviews and checking out their mouth-watering menu online, I’d really wanted to visit the So What? Vegan Restaurant. Sadly we didn’t make it this time as it was on the opposite side of Rome to where we were staying. Next time! Based on my childhood experience of vacations in Italy, I’d always considered the Italians to be the world’s best at two things in particular – ice cream and pizza – and having returned as a vegan adult, I can proudly say my opinion hasn’t changed. Great work Italians friends! I really hope the UK catches on with your gorgeous vegan ice creams & pizzas. Excellent. Great trip. And I need a copy of Funny Vegan. What a great review! 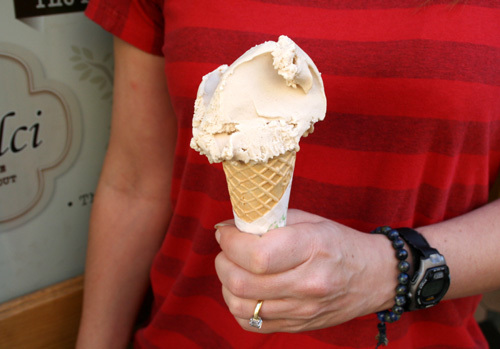 We tried gelato made with olive oil in Sardinia last year and it was delicious. 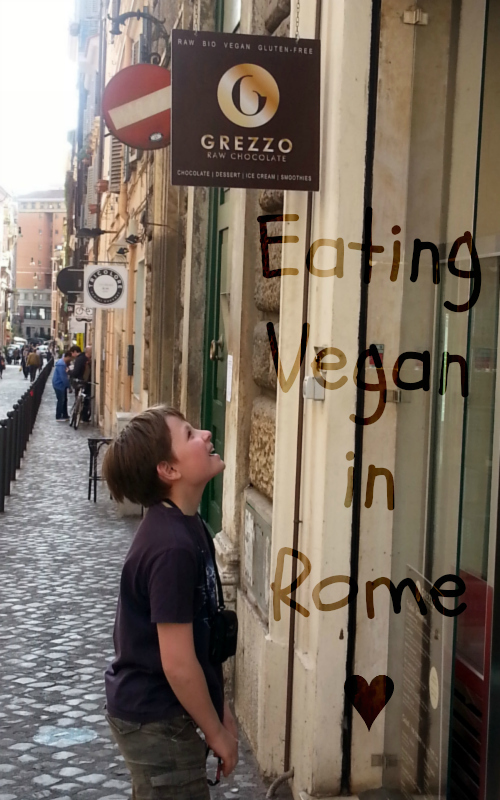 We’ve been pondering a trip to Rome for a while and your review makes me want to go there all the more – so many fantastic vegan options on top of all the cultural stuff. I had researched staying at The Beehive, which is a vegetarian/vegan friendly guesthouse but am interested to know about the accomodation you stayed in, given that the landlady was so helpful. Maybe you could let me know the details privately? Hi Sarah! Yes, I’m more than happy to help. If you have any questions, don’t hesitate to contact me (sharon@bitofthegoodstuff.com). 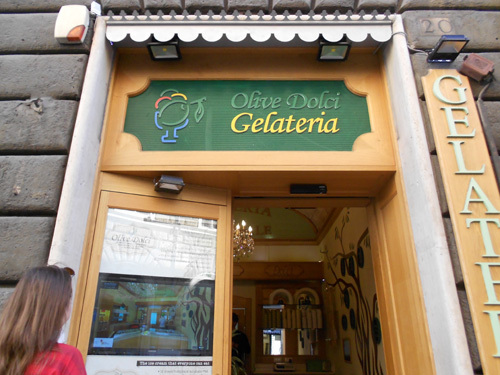 It’s great to hear that olive oil ice cream is available in Sardinia too. I’ve always wanted to visit Sardinia! Did you find it vegan-friendly there? Saradinia was amazing- we stayed in a lovely town called Cannegione where there was a health-food shop stocking lots of vegan products and plenty of vegan things in the local supermarket. I was surprised by how easy it was to be vegan there. I think that there must be a massive surge in demand globally. 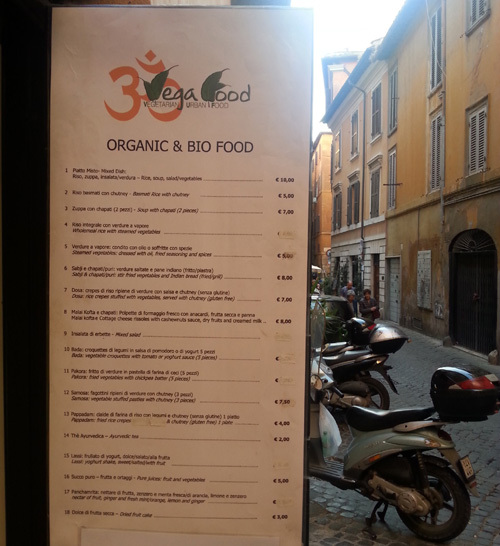 I’m really surprised, I would not have thought Rome would be vegan friendly at all! It was a total fail for me in France where I ended up living off of baguettes and hummus. As I am now gluten and dairy free I think I would not manage it well at all, although to be fair I was away on business and didn’t have that much choice on things. Hi Jen! With the exception of Paris, France is definitely the trickiest country I’ve been to when it comes to vegan-friendly eateries. Whenever we visit, I always make sure we hire a self-catering apartment then we make our own packed lunches and evening meals. It’s a great way to save money. We spent a small fortune in Italy as we ate out twice a day! Wow just wow! Definitely know where to head if we ever end up there now! Surprised by the olive oil ice-cream! Good to have another restaurant already lined up for next time too! Wowowow! 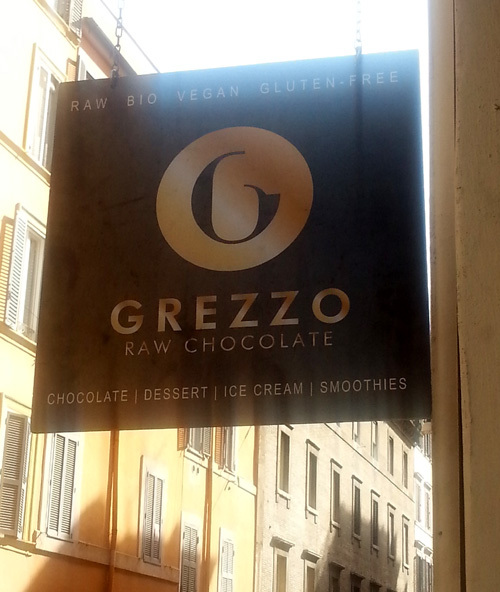 Who knewwww that Rome would be so vegan friendly!? Everything looks amazing. That map is an incredible resource….I wish they had one like that for everywhere! I think it’s time for a trip to Rome…! I know right? Rome seriously rocks! The Google map is awesome too. Wish we had one for every city! My only visit to Rome was in 1996, when then good ol’ world wide web was still a wee bairn … no Happy Cow or other maps for me, so I made do with gestures, dictionaries and ate in omnivore places. Sounds like 20 years has seen a revolution!! Fantastic review Sharon, I’ve already made a note it for when we eventually go. The ice cream looks delicious and I can’t get over how Europe is really trying hard to please compared with most of the UK with regards to Vegan and Gluten Free food. I have just come back from Rome. 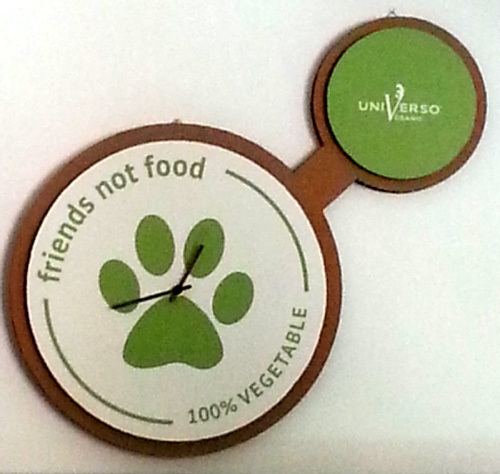 I followed partially your advices so I visited Universo Vegano, Buddy’s and Vega food. Everywhere was fine and delicious. Vega food – you might skip the samosas and koftas. Hi Kaloyan! I’m pleased to hear that the guide proved useful! Hope you had a great visit to Rome. It’s such a lovely city. I’d love to go back!